There is a closet in one of the upstairs bedrooms at Parchment House papered with a sweet floral design and lined with simple bent wire hooks. In my memory it’s very similar to a wallpaper I had in my bedroom as a child. I remember a time at once when I began to scrape away at this paper, to destroy it so it could be replaced. The walls of my room soon after turned to a semi gloss soft pink colour and were then besmirched by small wads of tacky goo to hold the posters that were so important to display; an expression of my independence and experience. That room, once mine, is no longer mine. It’s intrinsic value hasn’t changed, the hues of memory still waft in the space but essentially it is now just a room, no longer mine. I’m keeping the closet in Parchment and keeping the wallpaper. In one way it’s a design choice, an aesthetic I wish to preserve, but also it’s a memory in 3 dimension of a time long gone and a memory I can viscerally, visually hold. Not so the upstairs bathroom. There is no fondness here and the destruction you see before you eviscerates that (lack of) feeling. I love this photograph, it brings me joy to see the chaos, the disorder from which my vision can come. Some things preserved and some things destroyed, both recognising change, both representing me. Parchment House is a journey from and to a life explored, considered, meandered through, muddled along. A very good friend from London used to have a saying that came from her father; “Many a mickle makes a muckle”. 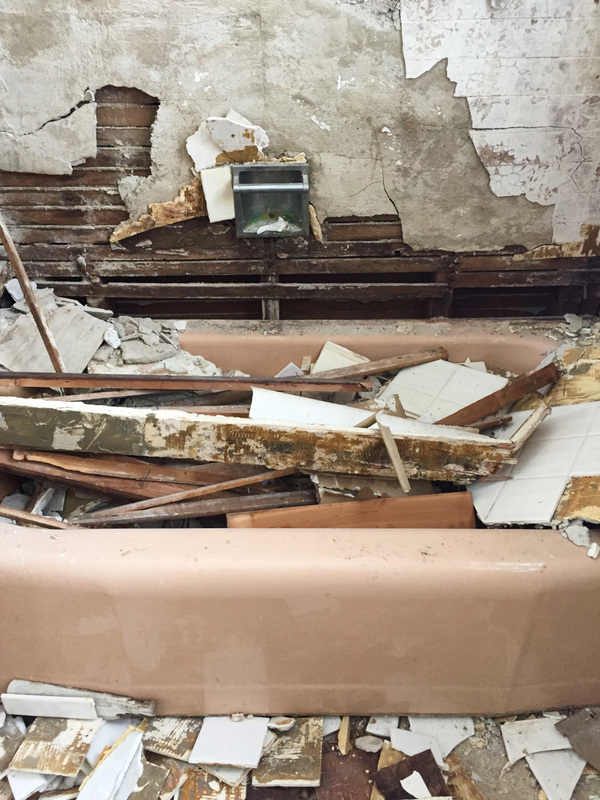 Whether it’s a closet preserved or a bathroom destroyed, it all means something much.